According to the report, a scarcity of qualified examiners to perform bedside binocular indirect ophthalmoscopy—which is further complicated by regional differences in the availability of such examiners—has led to increased interest in the use of telemedicine-based remote digital fundus imaging (RDFI-TM) evaluation techniques. Several studies, including the recent e-ROP study,2 support the use of fundus imaging to supplement face-to-face evaluations. According to the report, images could potentially be digitally transmitted to centralized evaluators, thus extending the care network individual physicians can provide, while, among other benefits, limiting liability exposure should vision loss occur despite appropriate care. RDFI-TM techniques may not be a complete substitute for bedside indirect ophthalmoscopy, according to the report, but they can at least be used as a first step to identify infants in need of further physical evaluation. The joint technical report also outlines practical considerations that should be reviewed by entities thinking about incorporating an RDFI-TM protocols, as well as a discussion of managing risks associated with the use of telemedicine in ROP evaluation. 1. Fierson WM, Capone A Jr; American Academy of Pediatrics Section on Ophthalmology, American Academy of Ophthalmology, and American Association of Certified Orthoptists. Telemedicine for evaluation of retinopathy of prematurity. Pediatrics. 2015;135(1):e238-254. 2. Quinn GE, Ying GS, Daniel E, et al; e-ROP Cooperative Group. Validity of a telemedicine system for the evaluation of acute-phase retinopathy of prematurity. JAMA Ophthalmol. 2014;132(10):1178-1184. The designation, granted to medications intended to treat a serious or life-threatening disease or to medications for which preliminary clinical research suggests a significant improvement versus existing therapies, means that the process of review for ranibizumab for DR will be expedited. The FDA’s confirmed action date is February 6. If the indication for ranibizumab is expanded, it will be the first ocular drug approved to treat patients with DR. The FDA accepted for priority review a supplemental biologics license application for aflibercept (Eylea, Regeneron) injection for the treatment of DR in patients with diabetic macular edema (DME). According to Regeneron, the target action date is March 30. In September, the FDA granted aflibercept a breakthrough therapy designation for DR in patients with DME. The FDA cleared the Rescan 700 (Zeiss), a surgical microscope integrated with intraoperative optical coherence tomography (OCT), for sale. Users have access to high-definition OCT images that appear in the microscope eyepiece of the Lumera 700 (Zeiss). The new device allows surgeons to see transparent structures in the anterior and posterior segments of the eye. 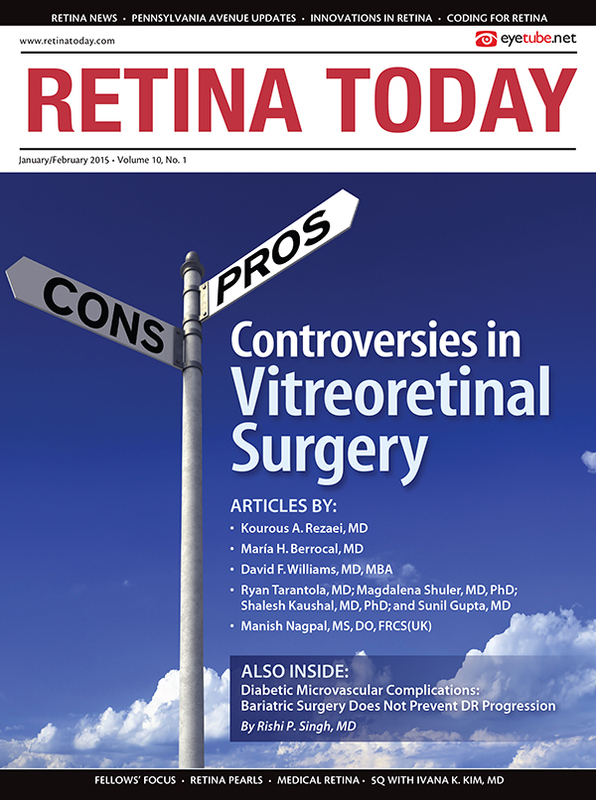 “We have found that real-time OCT feedback during surgery can improve our understanding of anatomy and impact surgical decision-making, particularly in membrane peeling cases and complex detachments—for example, proliferative diabetic retinopathy and proliferative vitreoretinopathy,” Justis P. Ehlers, MD, said in a company press release. The European Committee for Medicinal Products for Human Use has recommended approval of aflibercept for treatment of visual impairment due to macular edema secondary to branch retinal vein occlusion (BRVO). The drug is already approved in the European Union for treatment of macular edema secondary to central retinal vein occlusion (CRVO). Aflibercept is approved in the United States for the treatment of neovascular age-related macular degeneration (AMD), macular edema following CRVO or BRVO, and DME. The drug is approved in European Union for neovascular AMD and DME. Aldeyra Therapeutics has submitted an Investigational New Drug (IND) application to the FDA to conduct phase 2 clinical testing of it drug NS2 for the treatment of noninfectious anterior uveitis. The FDA must approve the IND application before the commencement of phase 2 clinical trials. NS2 is designed to trap free aldehydes in patients diagnosed with noninfectious anterior uveitis. “NS2 has the potential to reduce or eliminate the use of steroids in the treatment of this disease, which we believe would significantly enhance the treatment options for these patients and improve their long-term ocular health,” Todd C. Brady, MD, PhD, president and chief executive officer of Aldeyra, said in a press release. A license agreement for the integrin peptide therapy ALG-1001 (Luminate, Allegro Ophthalmics) has been reached between the American company Allegro Ophthalmics and the South Korean company Hanmi Pharmaceutical, according to a press release. Under the agreement, Hanmi received a license from Allegro for ALG-1001 as an intraocular injection for vitreoretinal diseases such as DME, wet AMD, and vitreomacular traction. The license rights are for South Korea and China. ALG-1001 is currently in multiple phase 2 trials. A single-practice retrospective chart review examined 109 patients with exudative AMD that received continuous fixed-interval dosing (every 4-8 weeks) of aflibercept, bevacizumab (Avastin, Genentech), or ranibizumab for at least 5 years. All patients received at least 6.5 injections per year; they averaged 10.5 injections per year. Of the patients studied, 109 received treatment for at least 5 years, 75 received treatment for at least 6 years, and 44 received treatment for at least 7 years. Mean improvement in letter score was 14.0 letters at 5 years, 12.2 letters at 6 years, and 12.1 letters at 7 years. Driving vision (20/40 or better) was achieved in 43.2% of eyes. “Our data suggest better outcomes with continuous therapy over published results with sporadic, as-needed therapy,” the authors concluded. 1. Peden MC, Suñer IJ, Hammer ME, Girzzard WS. Long-term outcomes in eyes receiving fixed-interval dosing of anti-vascular endothelial growth factor agents for wet age-related macular degeneration [published online ahead of print January 14, 2015]. Ophthalmology. doi:10.1016/j.ophtha.2014.11.018. In addition, only 4 of the 11 supplements (36%) contained equivalent doses of the AREDS or AREDS 2 ingredients. Researchers found that 4 of the 11 supplements (36%) included additional ingredients to the AREDS formula, including omega-3 fatty acids, non-AREDS vitamins, non-AREDS minerals, and herbal extracts. 1. Yong JJ, Scott IU, Greenberg PB. Ocular nutritional supplements: are their ingredients and manufacturers’ claims evidence-based? [published online ahead of print December 9, 2014]. Ophthalmology. doi:10.1016/j.ophtha.2014.09.39. Second Sight has announced an exclusive distribution agreement in Turkey, and its Argus II retinal prosthesis has been approved for use by Health Canada, the country’s regulatory agency. The device was approved by the Canadian government to treat patients with severe to profound outer retinal degeneration. This indication is slightly different from the indication approved by the FDA, which approved the device for patients with retinitis pigmentosa. Second Sight’s agreement with Erisci Elektronik, a Turkish distribution company, grants exclusive distribution rights for the Argus II. Applications have been submitted to Turkey’s social security institution in order to secure reimbursement for the device. Reimbursement coverage is expected in late 2015. CenterVue released the Eidon imaging system, a fully automated retinal imaging system employing confocal scanning and true-color imaging. Through confocal imaging and white light illumination, the Eidon provides improved contrast and image quality compared with a traditional fundus camera. The device is capable of imaging the central retina and periphery and offers a viewing angle of 110°. The imaging modalities available are true-color, red-free, and infrared.